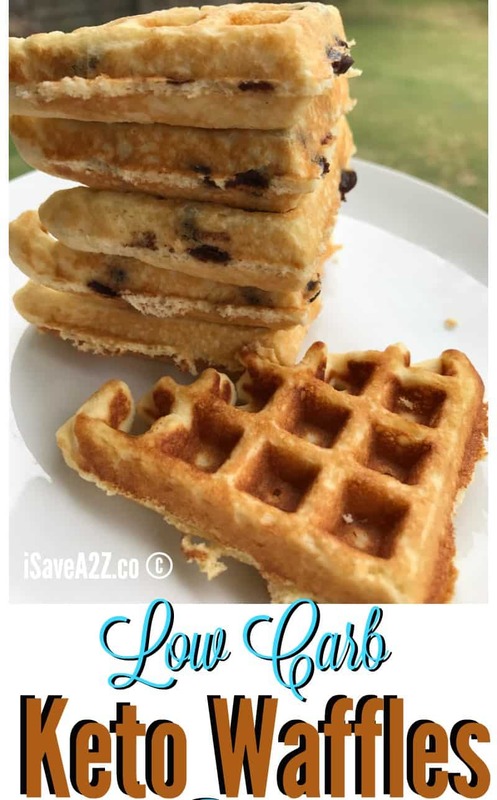 I have THE BEST Low Carb and Keto Fluffy Waffles Recipe for you!!! OH MY GOSH! This turned out amazing! I have been trying and trying to get big fluffy waffles and it finally happened! I have the Low Carb Pancake (Keto friendly recipe) memorized. 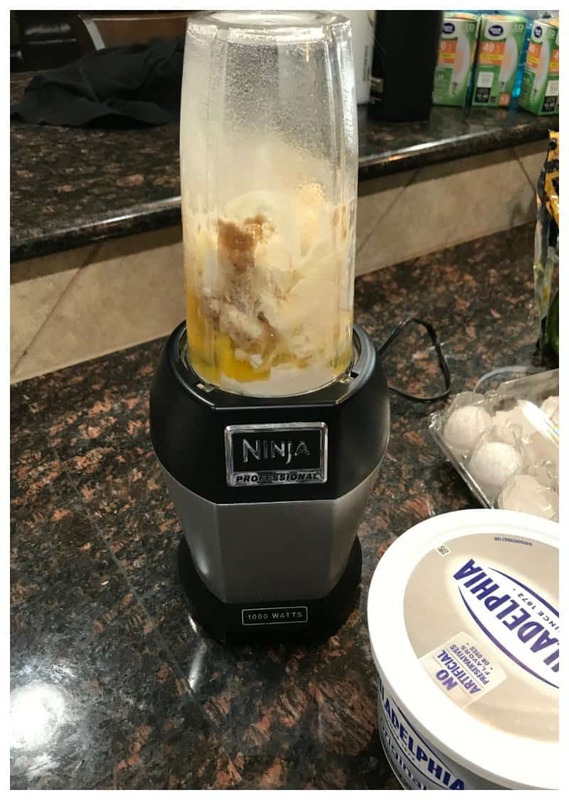 I never even have to reference the recipe anymore. From all of my years cooking and baking I was able to take that recipe and tweak it just a bit to make fluffy waffles! I was running around the kitchen yelling at my kids “It’s so fluffy! It’s so fluffy!” My kids swear I’m nuts! You can also add fruits such as strawberries or blueberries to this recipe too! 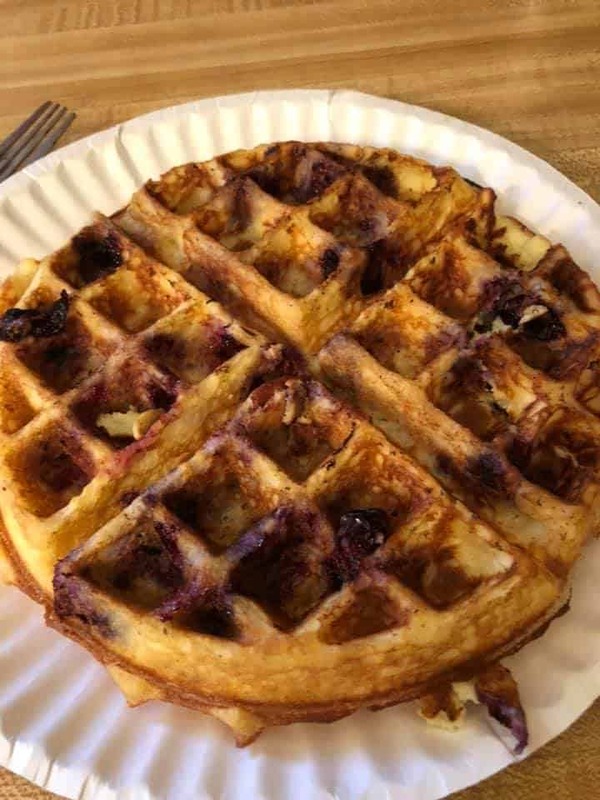 Dawnel shared her blueberry waffles with us in the Low Carb Inspriations Group on Facebook! Look! What’s even funnier… my youngest starting running around the house saying it too after she tried them! 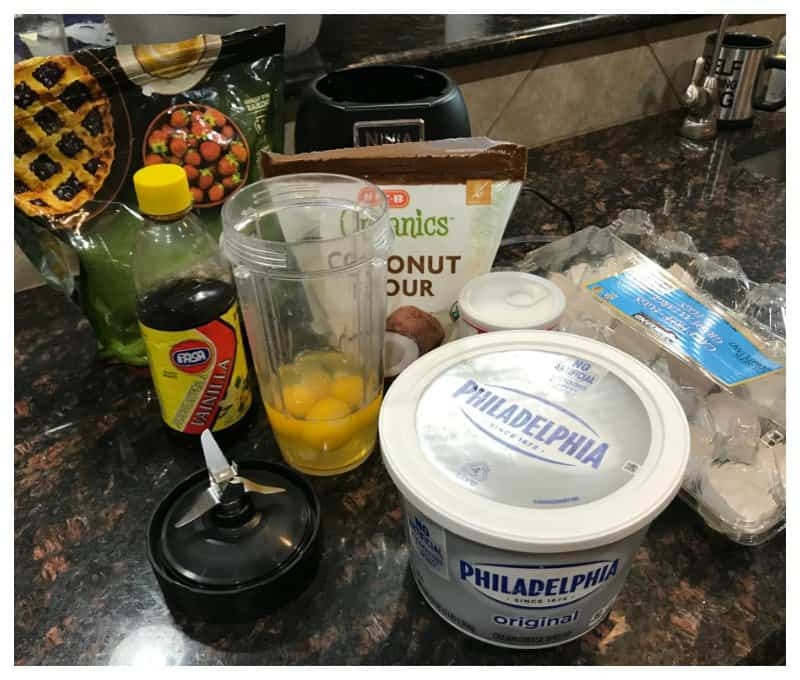 These Keto Waffles are her new favorite! Mine too! I love low carb waffles for breakfast, a fun way to kickstart the day. This recipe makes about 4 good sized waffles. You can double up the batter recipe if you want to make more. I filled up on half a waffle. They are very filling. You can grab the printable version of this recipe at the very bottom of this post. Optional: We added Lily’s Chocolate Chips to our waffles! So yummy and keto friendly! Note: If you want to invest in a blender, this blender is one of the best and easiest to use for a quick breakfast. There are two different size cups too. I always use the large cup because it holds most of the ingredients for all the recipes I use. For as small and compact it is, it has amazing power to blend ingredients! I have a really nice Blendtec blender that takes up tons of space on the counter. 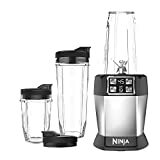 I find that I rarely use it because of this Blender. I’m not sure if it’s recommended or not but I tend to put the blending cups in the top rack of the dishwasher too. I’ve never had any issues. Love this thing! 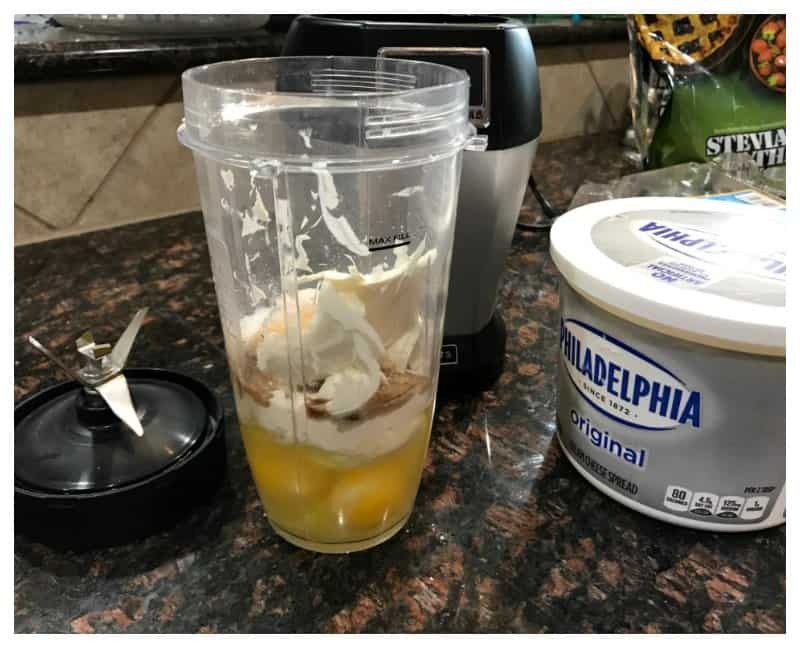 Add all the ingredients to a blender and blend it on high for about 1 minute until all the ingredients come out nice and smooth. If you don’t have a blender, you can mix it in a small bowl on medium speed for a minute or two. You will want to make sure you cream together all of the cream cheese so you don’t have any lumps. Pour about 1/8 to a 1/4 cup batter for each waffle. Note: the batter only spreads a bit more than the amount you put on the waffle iron. It’s not like the regular carb filled waffle recipe where you put a small amount on the iron and it’s dripping over the edges after a few minutes. These are very filling so don’t be surprised if you only end up eating 2 out of the 4 waffle squares. I tend to make some smaller for myself. By Jennifer on January 29, 2018 Breakfast, Keto Breakfast Recipes, Keto Friendly Recipes, Recipes. Where can I find powdered stevia? Is there an alternative to this? Can’t wait to try. What is the carb count per waffle? Thanks! Thank you for this recipe!! I’ve recently started keto and LOVE waffles for breakfast on the weekends. I tried recipes with almond flour and they were just meh. These are delicious!!! These are AMAZING! What is the nutritional info on these? Made these for the first time this morning, but it wont be the last! Very yummy! I will be freezing a few today to see how they reheat. I have a hubby who likes breakfast much earlier than I do and if these work out of the freezer and into the microwave to heat up, it becomes a great option for him. We put keto maple syrup (I make at home) and a few walnuts on top…So good! Oh, and I figured out my recipe which made 6 nice sized waffles were a smidge over 3 carbs each!! I can see these as a great way to serve strawberries and whipped cream for a shortcake option too..or blueberries…or…or…lots of ideas running thru my head! Thank you!!! Absolutely delicious!! How many carbs per waffle? These waffles are delicious! Thank you. These are wonderful!!! I made two changes. I used 1/4 dropper of liquid stevia instead of the powdered stevia and added an extra tsp of vanilla. I can’t believe how great these taste..my tastebuds are dancing. Served with walden farms sugar free syrup. I made these this morning. Thank you they were very good. I will be making these again! Could you use almond flour instead? What would the ratio be? Almond flour and coconut flour come out differently in certain recipes. I would not change it out. We used almond flour and turned out great! 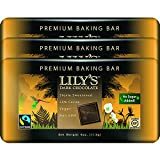 Sounds wonderful but I would suggest a cheaper version of non-dairy chocolate chips (Enjoy Life) and even they are spendy! I’m surprised to hear you can have the occasional pancake or waffle, however, I didn’t see the macros anywhere. Did I miss them? What I truly missed my first week was fruit. I already ate a Paleo style diet so adapting to this wasn’t hard, I just sub Stevia where I need to and my problem is eating enough fat, so I made fat bombs and I did well. I also learned I really like salami and I’m thankful I can eat cheese again! I dropped 5 lbs my first week! Kim, Congrats on the 5lb weight loss! Amazing! I thought the Enjoy Life chips had sugar? I think they use cane sugar. I’m not able to have sugar on Keto. I do remember they are pretty yummy though. Oh my gosh! These waffles are amazing! We have been on keto for three weeks and I have been missing bread like crazy! Every bread/bread-like substance we’ve tried has been dry and mealy and worst of all, really, really eggy. I am so glad I came across your recipe, it has saved my diet and I’m not even exaggerating when I tell you that I teared up a little when I put the first bite in my mouth. We’ve made these three days in a row now! These at are amazing! Thank you for the recipe. These were so good! I used almond flour because I don’t like coconut. Exactly what I was looking for. OMG, have tried several low carb waffles. Theses are the best!!! I need to get more cream cheese to put some in the freezer. I got 6 sections and ate 3! I couldn’ t stop. Thank you so much for a winner recipe. These are delicious and definitely fluffy. Great recipe! This is the fluffiest pancakes/waffles recipe I’ve ever made! I had serious thoughts about putting the recipe in vinyl on a container that stores my coconut flours! What waffle iron did you use? I have Bosch Universal Mixer and blender. This recipe worked very well in my blender and tasted really good. We use 3 tablespoons of almond and 1 of coconut instead…..fantastic! Total macros for me were 880 cal, 39g protein, 76 fat, 20 carbs. I think I could get about 3 servings from this.